This lot is comprised entirely of the admired Pacamara variety of Arabica, a cross between the giant-beaned Maragogipe and Pacas, a selection of the heirloom Bourbon. Gently bright and pungent in the small cup: fresh-cut cedar, buttery chocolate, night flowers, hints of apricot and pear. Impressively creamy mouthfeel; rich, flavor-saturated finish. Retains its buttery richness in two parts milk, with flavor dominated by a crisp dark chocolate. Miss Silvia was warmed up for over an hour for each of the two sessions today and had two flushes somewhere around 20 and 30 minutes into warm-up. It took me about 4 shots to get things dialed in unfortunately. Rocky needed to be tightened up a notch, which I did not expect. For these long beans, I needed to turn Rocky down to 2 from 3 (which seems to work well for many coffees). Once I managed to get the grind close, I worked on dosing. Fortunately, the 17g dose I typically use was pretty close, but was a bit bitter. I have learned that lesson from Miss Silvia and decided to lower the dose. I went all of the way down to 15g, but found that something between 15.5g and 16g seems to work the best (depending on humidity). Once I had El Blanco dialed-in, it became obvious very quickly that this was not going to be some dark fruit action. My wife and I were both surprised at how prominent the tropical fruit nose was. After sampling the fruit really came through on the mid-palate through to the finish….and a long finish it was. There was a nice chocolaty finish which was a little bitter for my liking, but that is more likely operator error than a “defect” in the roast or beans. A very fine espresso indeed. Tomorrow, I will play with the temperature a bit to see what effects that has and try to take a video or two of the extractions. 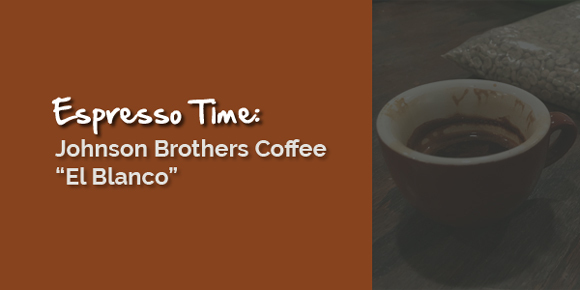 It was really a nice espresso to watch as the crema production on extraction is impressive. Disclaimer: I am not a Barista. For that matter I am not a good espresso maker. But, from time to time, I manage to extract most of the essence that the roaster intended from the coffee beans. These tasting notes are for my own diary of sorts and may be of interest to other Rancillio Silvia owners, espresso fanatics, or people who have too much time on their hands.